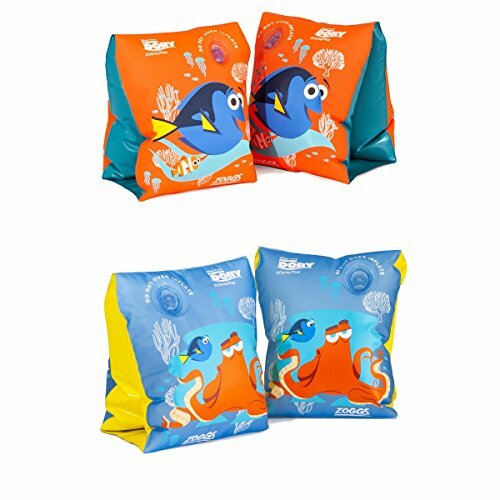 The Zoggs Finding Dory Kids Armbands are perfect for children aged 1-6 Years and are made to help out new swimmers with building confidence and getting used to the water. Exclusive to all new Disney movie: Finding Dory, transforming you into your favourite characters, including Dory and Hank. These armbands can be put on with ease when inflated, and are made from a heavy duty Vylux. Also featuring dual air chambers for safety whilst swimming, and easy inflate valves for 50% quicker inflation and deflation. Finished off with a flat contoured under arm gusset for added comfort, and character accents.